Datapath has added three new features to its Quant collaborative application sharing software: Chat, Meeting, and Quant Curtain. Quant is designed for general business collaboration where project teams can work on the same document in real time from different locations. Operation-critical control rooms can benefit from using Quant because it allows users on the same network to view physical sources connected to a video wall controller, wherever they are. This gives them access to up-to-the-second information leading to better informed decisions and faster response times. “Quant offers something truly unique to the collaboration marketplace: the ability to manage and share applications from a central source and view on a single end point or a video wall,” said Matthew Tibbitt, Datapath product manager. “The scope it brings to control rooms is of huge benefit to organizations of all sizes." Quant’s capabilities also allow users to view and share application windows, as well as interact and make changes to original source files, even if the third party does not have the application software installed. As this is all done on a peer-to-peer network, there is no load or potentially sensitive traffic on IT department servers. The three new features are designed to add significantly to Quant’s usability and functionality. Chat Function: Allows users to message one another about the application window shared, and enables ongoing dialogue between users. Meeting Function: Allows a user to lock either their own desktop or a Quant controlled video wall to a selected set of users. 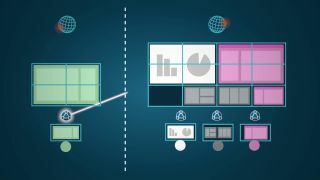 In a video wall scenario, a meeting organizer can determine who can share to the wall for instant viewing and avoid accidental sharing from others. This also increases security within meetings for shared video streams. Quant Curtain: Updated features allow an easier and smoother navigation experience. A button in the curtain enables users to add or remove shared desktops quickly. A Favorites option enables prioritizing the users most frequently interacted with, so that their desktops appear in the navigation curtain automatically. Quant is now available with a free 30-day trial.